The stock market has been on fire lately, and the returns are more than I ever could’ve anticipated. Even though I had projected that all of 2013 would have a low double-digit rate of return, we’ve already reached almost one-half of that projection in the month of January alone. For the month of January, the S&P 500 was up a total of 5.2%. Clearly, January was quite extraordinary. In addition to the S&P 500’s return noted above, the NASDAQ Composite was up 4.1% and the Dow was up 5.9% in January. Even the Russell 2000 Small Cap stocks had a banner month, ending up a stunning 6.3%. January was also unusual for bond investors, with virtually all investment grade bonds losing money during the month, but the performance of high-yield bonds was also unexpectedly good during January. On average, high-yield bonds were up approximately 1% for the month. This might not sound that great compared to stocks, but an annualized return of 12% for high-yield bonds is extraordinary and rarely achievable. For many years, there’s been talk that there would be a rotation from bonds to the equity markets. If that actually happens, we may see a much higher stock market in the next few years. I’m not convinced from the flow of funds that this rotation has started, but there’s clearly a move out of cash. If cash starts flowing into stocks, that should be positive for the market. Investors are finally getting the hint that CDs, money market accounts and other cash instruments aren’t paying much interest. The fact that typical money market accounts and CDs are paying negative real returns has finally caught on with even the most conservative investors. We’re finally seeing money from checking and money market accounts move into the stock market somewhat, but even more so to the bond market. Investors are finally saying no to the incredibly low interest rates that banks are paying. Frankly, it’s not surprising that banks are discouraging these cash investments. For some time, banks haven’t needed cash deposits since they don’t have enough loan demand to fulfill their cash requirements. Banks have forced interest rates down on savings investments to such a low level that even the most novice and unsophisticated investors are declining those investments. And that’s exactly what the banks want since they have no need for this cash. Therefore, investors are moving their money to where it could potentially earn more. As I’ve mentioned on multiple occasions, the most important of these components is corporate earnings. While interest rates and the economy are also important, what corporations are earning today is the most significant aspect. This past Friday, the Dow broke the 14,000 point level, which is its highest level since December of 2007 and is only 160 points lower than the Dow’s all-time high. While these big, round numbers are not particularly important, the fact that the Dow has reached the same level it was at in 2007 is very important. As most of you are probably aware, the markets decreased dramatically in 2007 and 2008, and the rebound only began in earnest in 2009. Since that date, the S&P is up a stunning 125%. Investors who were convinced that the market would never recover and didn’t invest during the intervening five years were obviously wrong. If they had invested on a regular basis during those years, their returns would have been greater than just letting their money sit in cash. 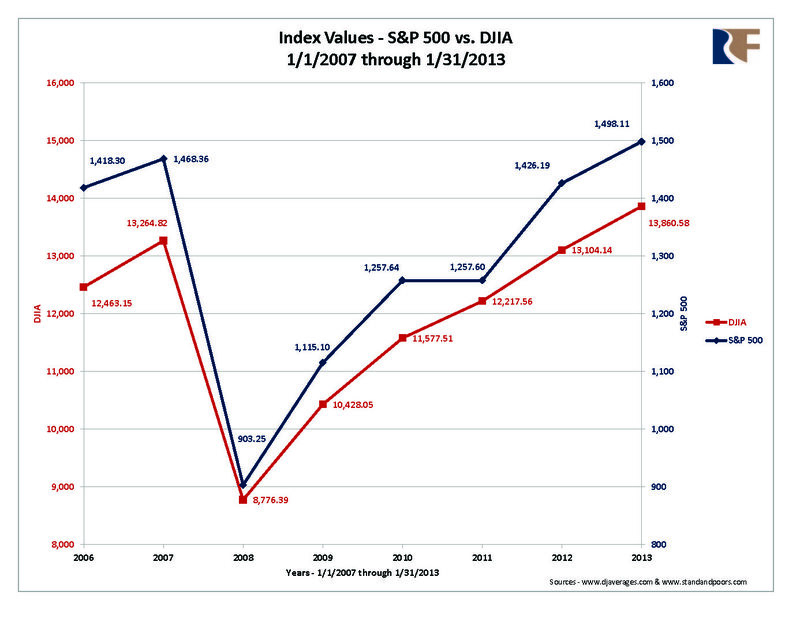 The issue is whether the Dow was overvalued in December 2007 or if it is overvalued today. Many investors would be shocked to discover that only 12 of the Dow’s 30 stocks are selling at less than their December 2007 level (e.g., Exxon, AT&T, Intel, Microsoft, Bank of America and Alcoa). The loss in those stocks is dramatic, and on average, they are worth approximately 32% less than they were in 2007. However, the remaining 18 stocks are up 28% (on average) since 2007. 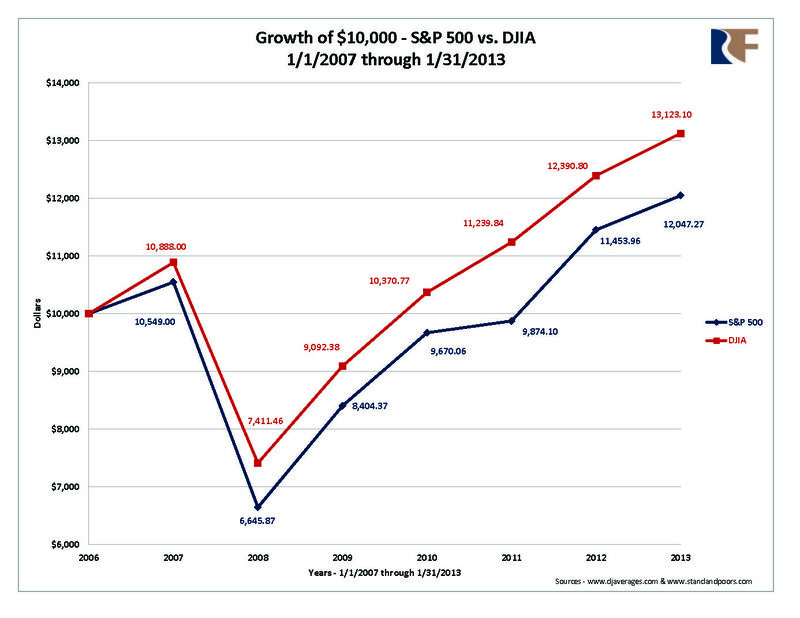 Accordingly, in the intervening five years, the value of the Dow is almost exactly what it was in 2007. The difference is that corporate earnings in these same 30 stocks is an overwhelming average of 32% higher than it was in 2007. In other words, these 30 Dow stocks are essentially valued the same today, but an earnings gain of 32% makes the portfolio look significantly cheaper than it was in 2007. 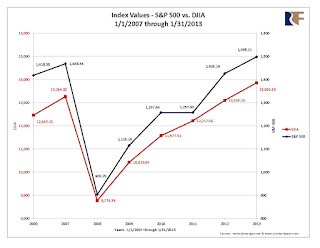 An additional valuation metric is the interest rates that compete with stock market investing. For example, money that would ultimately be in the stock market would venture back to risk-free CD rates if they were high enough to attract the money. Back in December 2007, the 10-year Treasury bond was yielding 4.04%. Today, a 10-year Treasury is yielding 1.92%, or one-half of what they were in 2007. Of the three most important positive investing components on my list above, we have higher corporate earnings and low interest rates. Two out of three ain’t bad. It was recently announced that the U.S. GDP for the 4th quarter of 2012 was marginally negative. After reviewing the report, I find many inconsistencies that I’m sure will be worked out in later revisions to the 4th quarter GDP. It appears that due to inventory adjustment levels, the GDP will actually be up approximately 1% once revised. That means that for all of 2012, the GDP will be approximately 2.2%. This may not be sterling, but it’s not negative either. Employment continues to struggle with the unemployment rate at 7.9%. It was recently announced that there were 157,000 new jobs added during the month of January, and certainly, jobs have been created over the last several years. Again, employment may not be high, but it’s not at a disastrous level, either. That being said, the unemployment rate is undoubtedly devastating for the millions of people who remain unemployed. It seems that we are in decent circumstances for investing. The economy isn’t so hot that the Federal Reserve will move quickly to eliminate their assistance to the financial markets. In fact, they’ve announced that low interest rates will be the norm through 2014. If the economy gets too hot and the unemployment rate drops dramatically, the Fed will most certainly reduce their stimulus activity. Perhaps we’re in the middle of a Goldilocks economy – it’s not too hot, and it’s not too cold. At this point, I’m relatively certain that the Fed will keep interest rates fixed at a low level for another two years. Moreover, corporate earnings are excellent and are getting even better. America has $1.5 trillion in cash to use as a security blanket for the future or to expand and build new plants and equipment. Corporate America is stronger today than it has been in generations. Adding to all the positive traits described above, there’s been an explosion in U.S. manufacturing due to low energy costs, a stable economy and a technologically trained workforce. For the first time in quite a while, manufacturing is on the upswing, exports are increasing and imports are declining. Notwithstanding the extraordinary measures that Washington goes to limit the development of fossil fuel markets, energy is exploding in the United States – not only in oil production, but also in natural gas production. I’m not so Pollyanna that I’m completely blind to the obvious problems we face in the U.S. We have a totally dysfunctional and inept government in Washington. While everyone can agree that many things need changing, our leaders in Washington can’t seem to get on track. Corporation taxation undoubtedly needs overhauling, but no one is making the necessary changes. But even this adds to a bullish outlook for the next few years. After all, some of our best markets were during times of political gridlock in Washington. Therefore, perhaps the government dysfunction we’re seeing represents a wonderful buying opportunity. This Goldilocks economy along with low interest rates and higher earnings provides us with the best of all worlds. In fact, there is some indication that bond owners are moving those positions into conservative stock funds, and I expect that trend to continue for the rest of the year. I certainly can’t anticipate an annualized yield for the year based on January’s results, but I still think we’re on track to meet my low double-digit return target for 2013. It won’t be straight up or straight down, but when it’s all said and done, I think that goal is attainable. 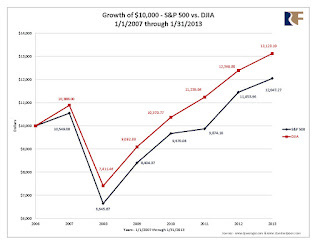 With the increase in income tax rates for investments instituted on January 1, 2013, there is more incentive than ever to make IRA contributions. Much is to be said for deferring money to an IRA, especially for taxpayers in brackets in excess of a 50% tax rate. Moreover, taxpayers under age 70½ can make maximum annual contributions for your spouse and for yourself, even if only one of you has taxable compensation. And if neither spouse participated in a work retirement plan, all of your contributions may be deductible. Those of you who are age 70½ and older can’t make regular contributions to a traditional IRA. However, you can still contribute to a Roth IRA and make rollover contributions to a Roth or traditional IRA regardless of your age if you and your spouse have earned income below a certain level. Similar to a traditional IRA contribution, if only one spouse has earned income (even if only from a part-time job), you can still potentially establish a Roth and make contributions for both spouses. For 2013, the maximum amount you can contribute to all of your traditional and Roth IRAs is the smaller of $5,500 ($6,500 if you’re age 50 or older), or your taxable compensation for the year. The IRA contribution limit doesn’t apply to rollover contributions and qualified reservist repayments. For younger individuals, a significant amount of money by the time you reach retirement age can be saved by making annual Roth contributions. For example, an annual contribution of just $5,000 for 30 years could grow to $566,416. In other words, after 30 years, that person would have invested $150,000 in the form of Roth contributions, which could potentially grow at an estimated 8% average rate, earning $416,416. This entire amount could be withdrawn tax-free upon reaching age 59½. Succinctly, making IRA contributions is a great strategy for increasing your wealth, especially in light of the new tax rates and notwithstanding whether or not the contributions are tax deductible. The earlier you can get started on this strategy, the better off you will be! 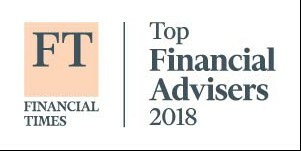 If we can assist you with making an IRA contribution for the 2012 and 2013 tax years, or if you would like a complimentary review of your tax and financial plan, please let us know. Two new requirements began in 2011 that concern issuers of Forms 1099 that we would like to bring to your attention. Generally, any trade or business that makes payments in the course of that trade or business of interest, rents, compensation, remuneration for services, annuities, etc., aggregating $600 or more for the year to a single (unincorporated) payee is required to report the payments to the IRS and to the recipient of the payments by filing Form 1099. This reporting requirement generally does not apply to payments to corporations. However, the 1099 reporting requirements do apply to payments made to corporations for attorneys' fees, and to amounts paid to corporations providing medical or health care services. In light of these two new requirements, we are recommending that our clients review their payables for 2012 to determine if payments were made aggregating $600 or more to corporations for attorneys’ fees and/or to corporations providing medical or health care services. If so, Forms 1099 will need to be generated to those specific corporations. Moreover, if you want to protect your income tax deductions, you must properly transmit your Forms 1099 to the IRS by February 28, 2013. Finally, it is a common misconception that if a taxpayer does not receive a Form 1099 or if the income received from a payer is under $600 for the year, the income is not taxable. This is not true. There is no minimum amount that a taxpayer may exclude from gross income. All income earned is fully taxable and must be reported regardless of whether or not you receive a Form 1099. Please let us know if you require assistance in generating your Forms 1099, or if you have any compliance questions regarding the Form 1099 requirements. Ticket packages will be sent along with our invoice once we have the tickets in-hand from the Braves. Please note that payment for the package is due upon receipt. Because we want all of our clients to have the chance to purchase a ticket package, clients are only allowed to reserve one ticket package per season. To reserve your ticket package, please contact Ellen Black at 404.892.7967 or eblack@rollinsfinancial.com. And keep in mind that these packages go fast as the weather warms up!